Claytons Kitchen is open seven days a week for breakfast, lunch, afternoon tea and dinner, Claytons Kitchen at The Porter, is the culinary home to The Porters resident chef Rob Clayton. Rob has previously gained a Michelin star at Hunstrete House and another at Bath Priory. Delicious seasonal dishes using the freshest quality ingredients are the inspiration for Rob’s menus. This, coupled with the restaurant’s friendly, relaxed vibe and carefully chosen wine list, makes Claytons Kitchen at The Porter a favourite whether you are a die-hard foodie, dropping by for a casual bite to eat or simply picking up some treats from the Claytons Kitchen range. Rob began perfecting his art in 1988 at Ménage à Trois London, achieving his first Michelin star aged just 25 as head chef at Hunstrete House Hotel. He remains one of the youngest chefs ever to do so. Rob gained a second Michelin Star as executive head chef at the Bath Priory. Since then his work has continued to achieve high praise, winning Pub Company Menu of the year and Food Champion of the Year. 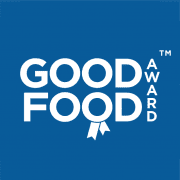 Claytons Kitchen, 15a George Street, Bath, BA1 2EN have now been awarded the prestigious Good Food Award for 2015. Over the last twelve months we have evaluated customer feedback and these premises have demonstrated exceptional levels of food quality, service and value when compared to industry benchmarks in their category.